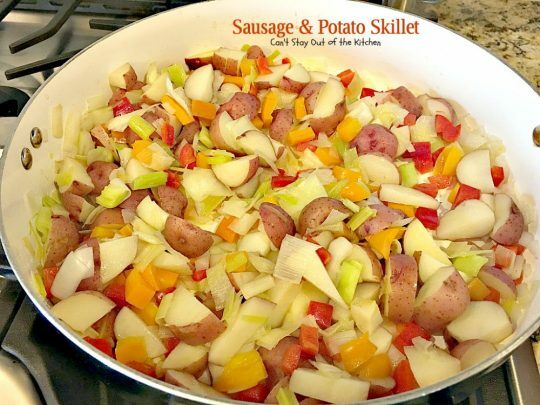 Sausage and Potato Skillet is a delightful one-dish dinner entree that’s so quick and easy to make. Oscar Mayer now makes a sausage without nitrates and preservatives. When my husband found a bunch of them on close out at Kroger he bought them and stashed them in the freezer. 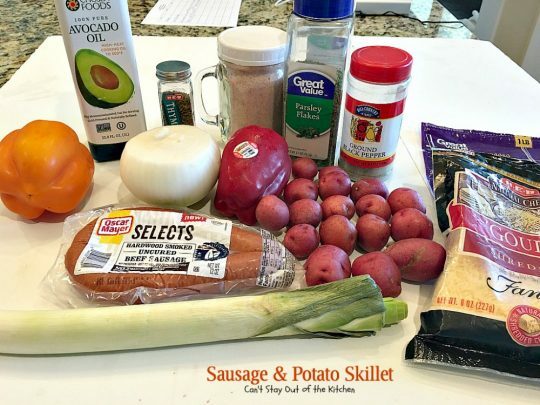 Back in August I decided to try the sausage with this recipe. It was wonderful. By now if you’ve been following my blog you realize I’m in the middle of a makeover. My son was tired of the other theme and thought I needed a change. We still have not got the recipe card working properly or the search function. I hope you will bear with me while we try to get everything converted to the new theme. In the meantime, I will post when I can. Back in 1999 I went back to work full time after years of being home with my kids. I worked in a church office in Cedar Hill and one of the other secretaries made this one time for a luncheon. When she gave me the “recipe,” there were no amounts given and just a cursory explanation of what to do. 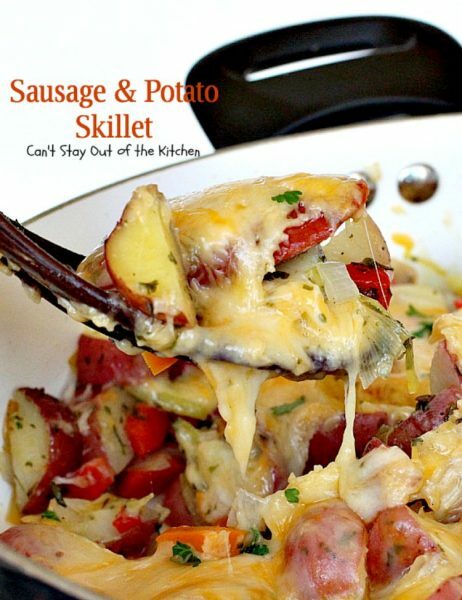 She only jotted down three ingredients: sausage, potatoes and cheese. While I can wing it on recipes with the best of them, I’ve found it easier to have more of a guide than what she gave me. For this one-dish skillet entree, I sautéed red potatoes in avocado oil. Then I added onions, bell peppers, leeks and seasonings, followed by the sausage. After everything was cooked I topped it with Gouda cheese and a little Fiesta blend cheese. 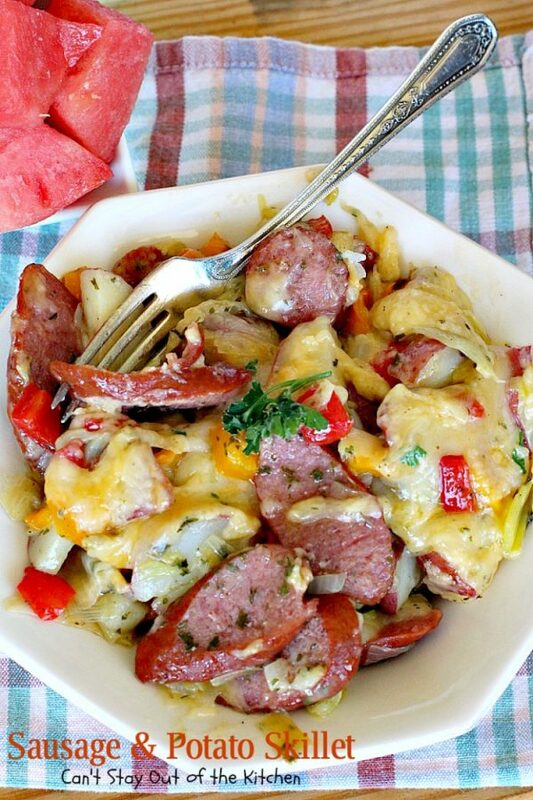 If you’ve never used Gouda before it has a smoky, deep, rich flavor that works perfectly with sausage. But if you don’t have that on hand, you can easily substitute cheddar, Monterey Jack or even a Jalapeno cheddar cheese if you want more kick. 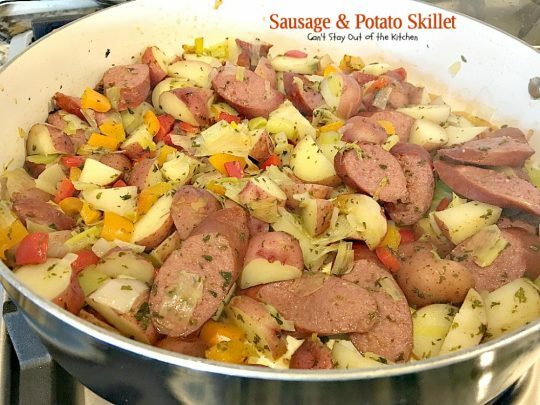 Sausage and Potato Skillet is a tasty and healthier alternative to whipping out boxes of macaroni and cheese when you’re short on time for dinner preparations. It’s not necessarily low calorie, but it is gluten free for those with gluten intolerance and a great way to use up some garden produce if you have it. Not only that, but you will enjoy every mouthful. 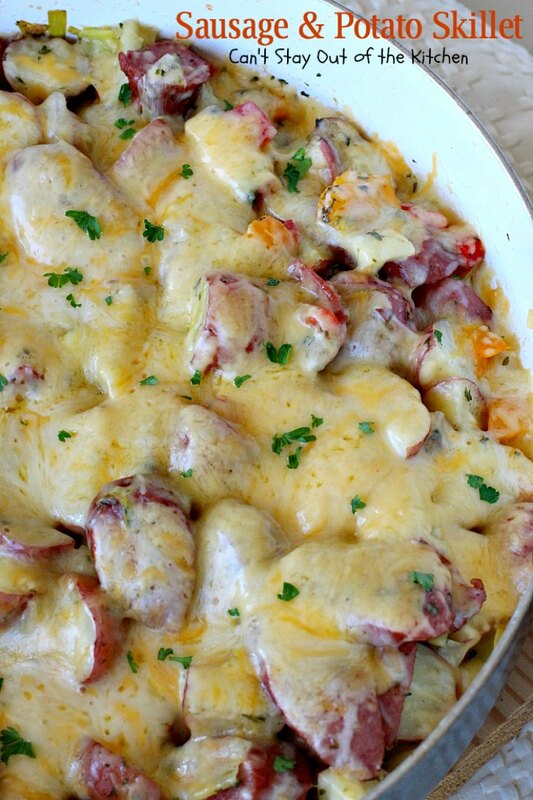 It’s total comfort food that’s hearty and satisfying. This recipe was featured at Favorite Southern Recipes here. Sausage and Potato Skillet is a delicious one-dish meal that’s very quick and easy to make. This gooey dish is absolutely delightful. I used nitrate-free, preservative-free sausage to make this a healthier meal option. I used these ingredients. I had gouda cheese on hand that I wanted to get rid of, but Cheddar will work fine too. Heat avocado oil in a large skillet. 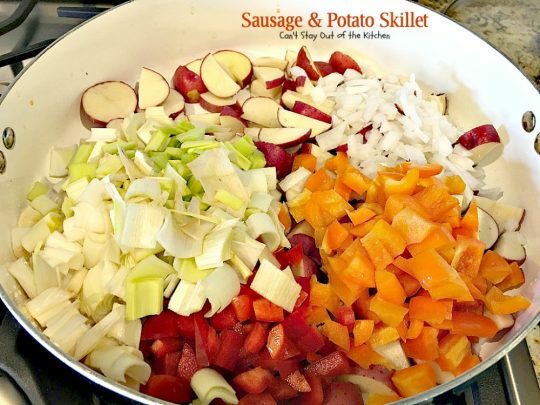 Add potatoes, onions, leeks, red and orange bell peppers. Saute until potatoes are fork tender. Add seasonings and sliced sausage. Top with gouda cheese and fiesta blend cheese. Cover with lid and allow cheese to melt. 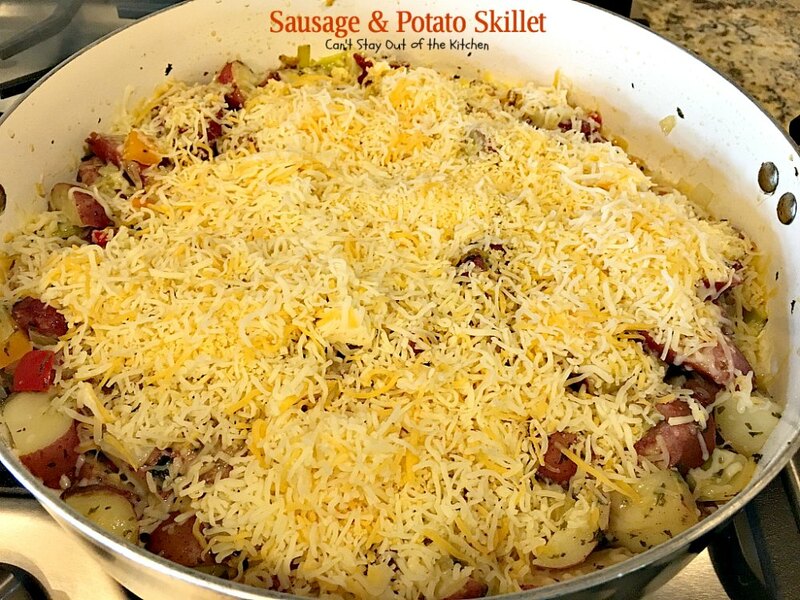 Every bite of Sausage and Potato Skillet is terrific. 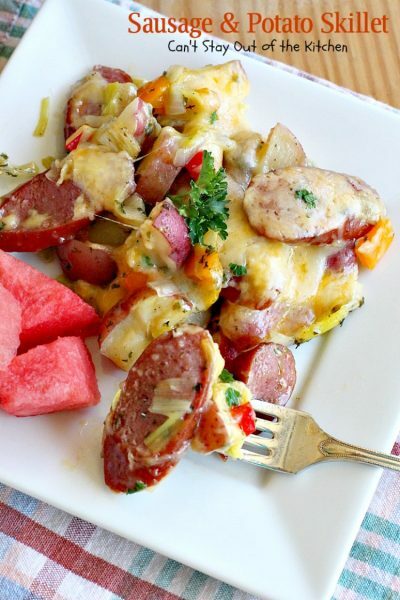 This savory dish has rich, deep flavor because of the Gouda cheese. This savory and delicious sausage recipe can be made for breakfast or dinner. 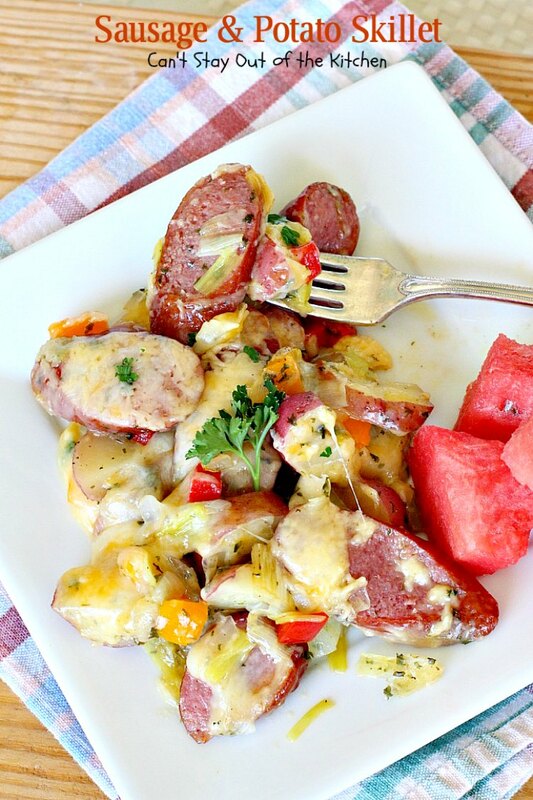 It's quick and easy and uses nitrate-free sausage, red potatoes and Gouda cheese. Gluten free. Melt avocado oil in 12” skillet over low to medium heat. Add potatoes and sauté about 5 to 10 minutes. Add bell peppers, onions and leek. Cover with lid and continue to stir and sauté about 10 minutes longer. 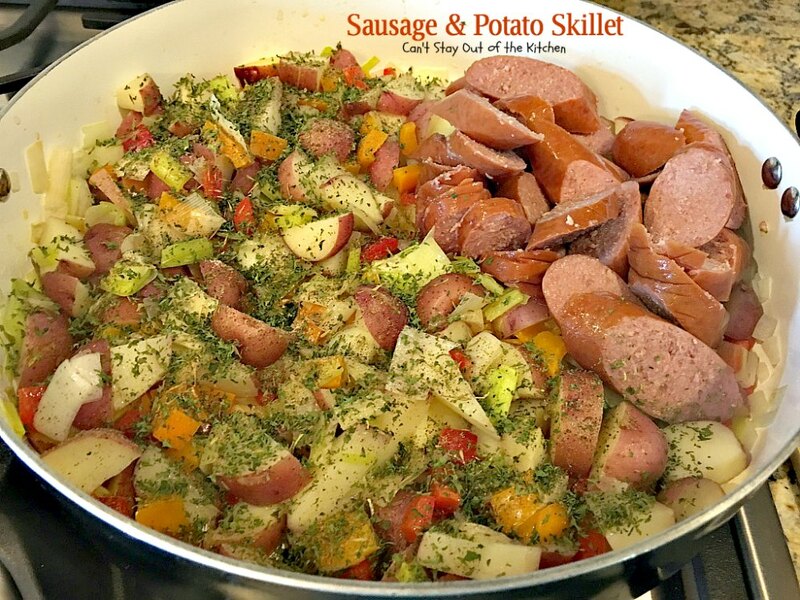 Add sausage and seasonings and cook until veggies are fork tender and meat is heated through. 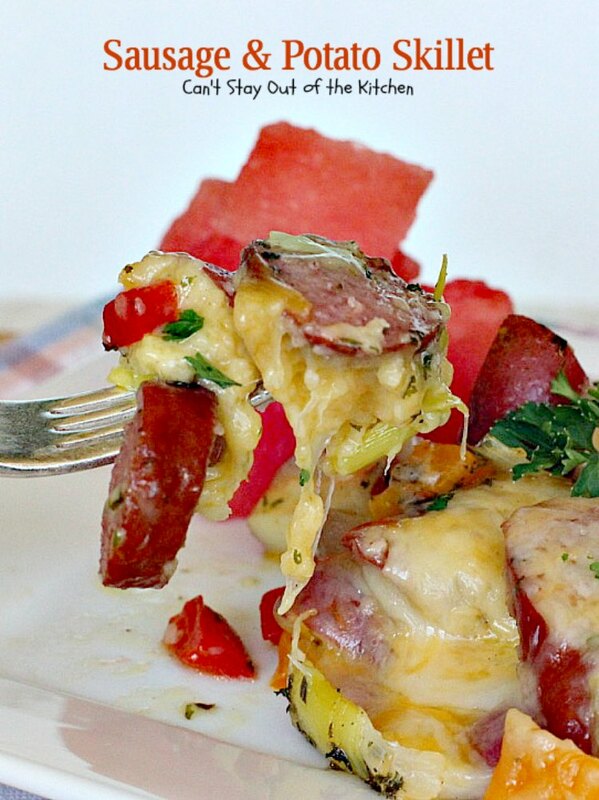 Sprinkle cheese over top and cook until cheese melts. 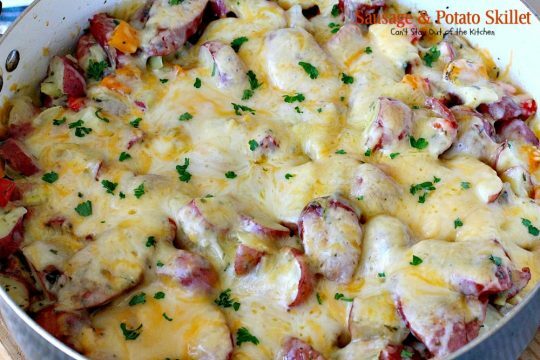 NOTE: The original recipe placed the ingredients in a casserole dish after sautéing, then covered with cheese and baked at 350° for about 10 minutes until the cheese melted. Either way will work. NOTE: I used Gouda and Fiesta blend cheeses because that’s what I had on hand. This works equally well with sharp cheddar cheese. If you want a little extra bite to it, I would use Pepper Jack cheese. Cheese, sausage and potatoes work really well together. 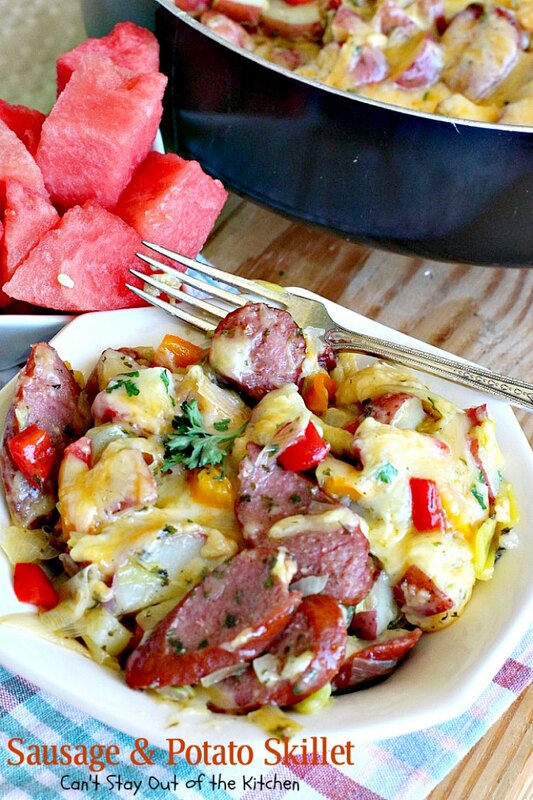 Serve Sausage and Potato Skillet with fruit or a side salad. This is a great meal to serve when you’re short on time. My mom used to make sausage and potatoes, and it was always good! I like your version with the added cheese.